What do you think of the new loopity loop yarns? I personally love them. 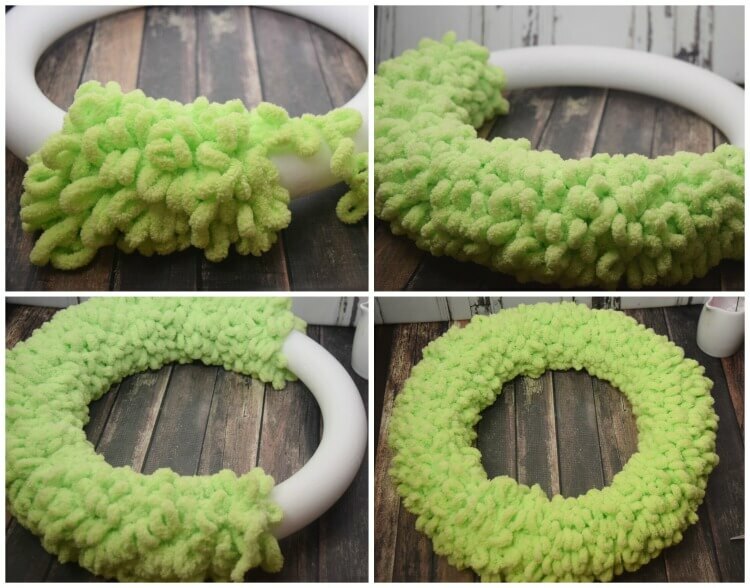 They are just perfect for making yarn-wrapped wreaths that end up being so full and plush. I just love running my hands over them. 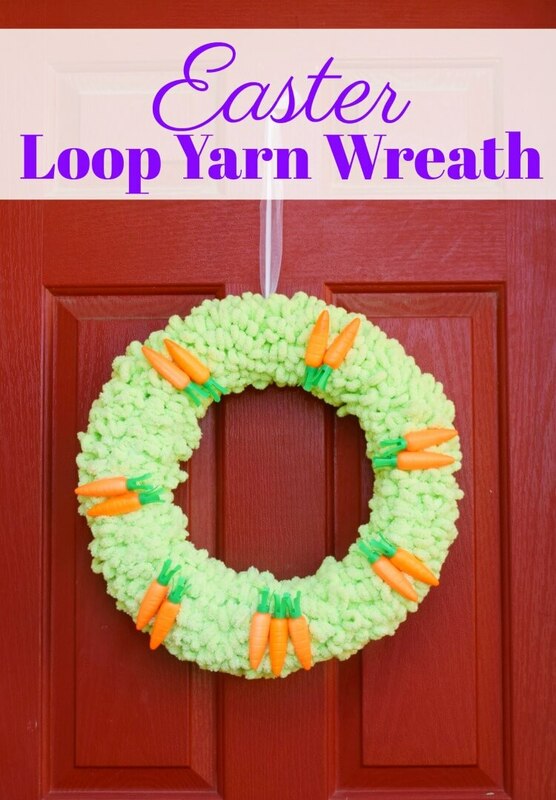 My Valentine’s Day loop heart wreath was so popular, I decided to do another version for Easter with this Loop Yarn Easter Carrot Wreath. 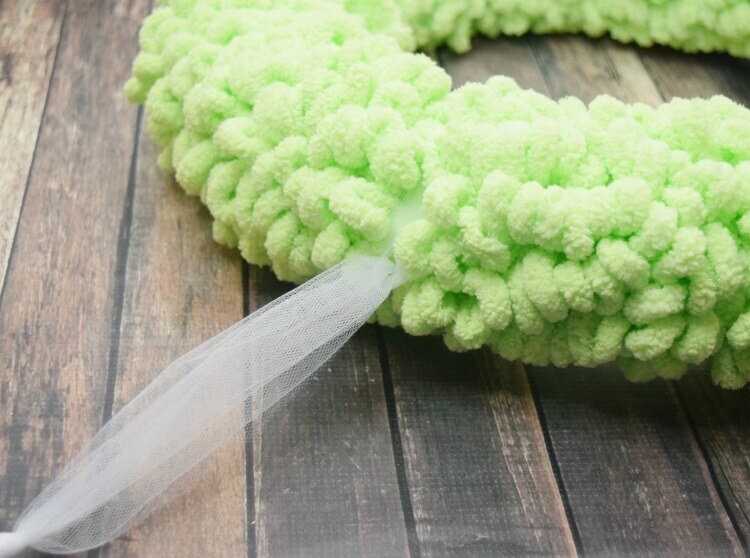 This wreath will take you about 15-20 minutes to make at the most. I have discovered it is much easier to wrap a circular wreath with loop yarn compared to a heart-shaped wreath. I had that wreath wrapped in no time. I found these Big Twist Loopity Loop skeins to be a lot bigger than the Red Heart loop yarns. Two skeins are all you need for this 16-inch wreath. Tie the end of the skein of yarn around the wreath then begin wrapping it around the wreath. As you wrap, push the yarn together to make it full and plush. When you need to add the second skein, just tie it on like you did the first and keep on wrapping. I found I used up almost the entire second skein. I had just a smidge leftover. Before decorating your wreath, take a piece of tulle or ribbon and fit it between the yarn and tie it on, to hold the wreath for display. 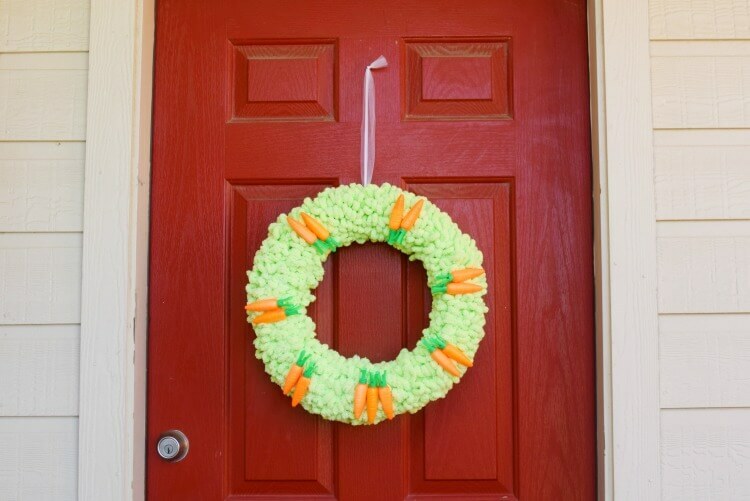 I used these plastic carrots from the Dollar Tree for decorations. They are actually full of powdered candy. I liked how bright the color was and thought it went very well with the lime green. I was going for something that did not look very realistic, but more something that complimented plastic Easter eggs. 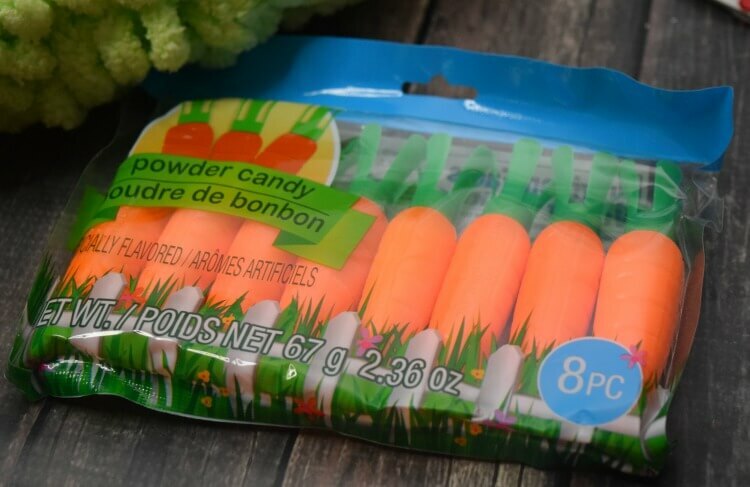 These candies were perfect. 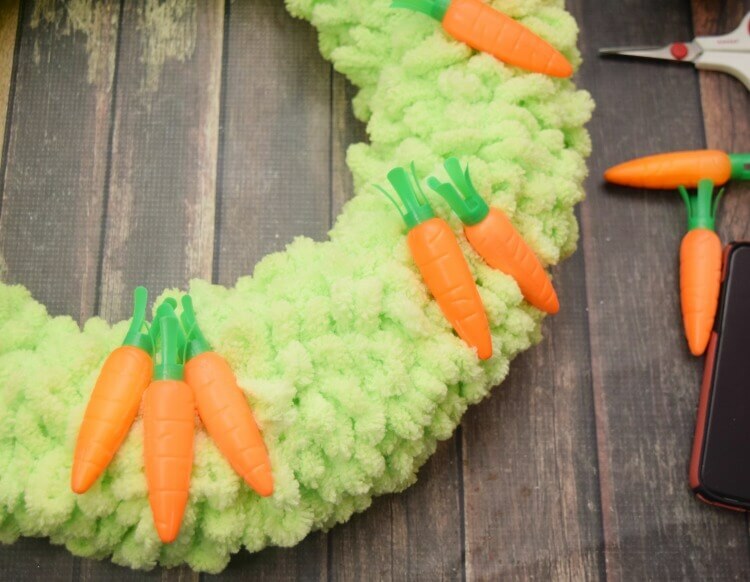 Lay out your carrots however you like them on the wreath and hot glue. I used 3 at the very bottom center and 2 per section all the way around. Now it’s time to hang your wreath! 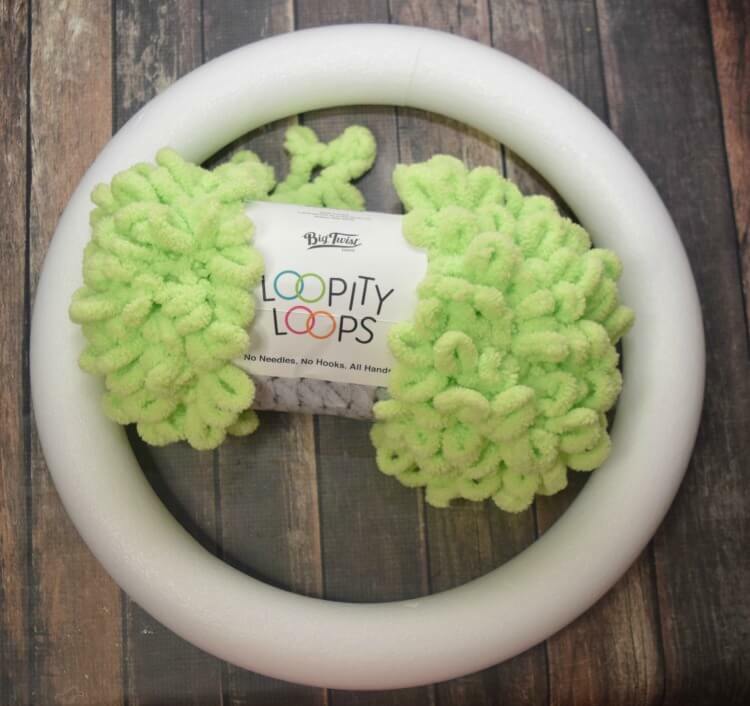 This past weekend I found pom pom yarn that is very similar to these loopity loop yarns, and I’m going to try to experiment with it and see how it goes for wreath making. I’m hoping it works out just as nice. Stay tuned! This post contains affiliate links in which I make a small commission if you make a purchase through those links.